Good news for Micro Four Thirds stills shooters. 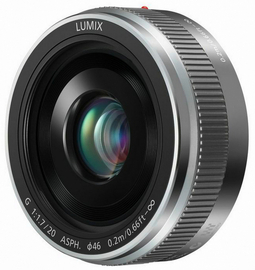 The newly announced Panasonic LUMIX G 20mm f/1.7 II ASPH lens ($399, also available in a silver finish) features a metal mount, supports Panasonic's Contrast AF for precision auto focusing, and is lighter and more compact than the previous version. But according to Steve's Digicams, "The only real catch is that, when recording video, if you leave Continuous AF on, you will hear some noise. Panasonic recommends leaving AF off for video."